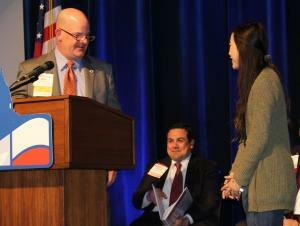 The 2019 Edmund Kuempel Public Service Scholarship recipients, Anna Grun and Christopher Greenwell, were honored at the Texas Legislative Conference on Friday, March 22, 2019. Anna Grun will graduate this year from Memorial Early College High School with both a high school diploma and an Associate’s Degree. While maintaining a 3.9 GPA, she has also been very involved in her school through many clubs such as the National Honor Society, American Sign Language Club and Science Club. Anna has also been an active volunteer with many organizations such as the New Braunfels Humane Society, New Braunfels Food Bank, and Oakwood Baptist Church while working up to 30 hours per week. Anna plans to attend Texas State University and major in Criminal Justice, followed by law school and the ultimate goal of becoming a District Attorney. Christopher Greenwell is a senior at New Braunfels High School with a long list of school and community service activities. 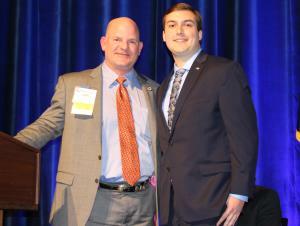 Christopher is the National Honor Society President, a graduate of the Youth Leadership New Braunfels program, a member of the Student Council, an NBISD School Board Student Representative, an American Legion Boys State Senator, and served on the NBHS School Safety Committee. He has also been awarded the NBHS Senior of the Month and the Daughters of the American Revolution Good Citizen Award. Christopher will attend Texas A&M University this fall to major in Business Administration and Public Administration to become a City Manager and would like to run for state office in the future.